Support for aftermarket aircraft is provided by a "profile" that tells PlaneCommand how to interoperate with the aircraft. PlaneCommand comes with profiles for all built in X-Plane 10 and 11 aircraft, and some popular aftermarket aircraft. See list of supported aircraft. A profile is a per-aircraft JSON file that describes how PlaneCommand should interact with aircraft. It describes what commands and datarefs should be used to accomplish certain tasks. Not every command in PlaneCommand can be customized with profiles. I've tried to make several of the commonly varying systems configurable to make most aircraft easy to adapt. Put PlaneCommand in debug mode. To do this, edit X-Plane 11/Output/preferences/planecommand.json and change the debug property to true. Download Visual Studio Code to edit the profiles. This isn't absolutely mandatory, but if you have an editor that supports JSON schemas then everything becomes easier. name aircraft name to be used for display (ie, what this profile is called). name_filter Used to match this profile to an aircraft. A search string (regex) designed to match the X-Plane aircraft name. When a new aircraft is loaded, all aircraft profiles are compared against X-Plane's aircraft name to figure out which profile to load. author_filter Used to match this profile to an aircraft. A regular expression designed to match the author name. This has to match the current aircraft, or the profile won't be used. 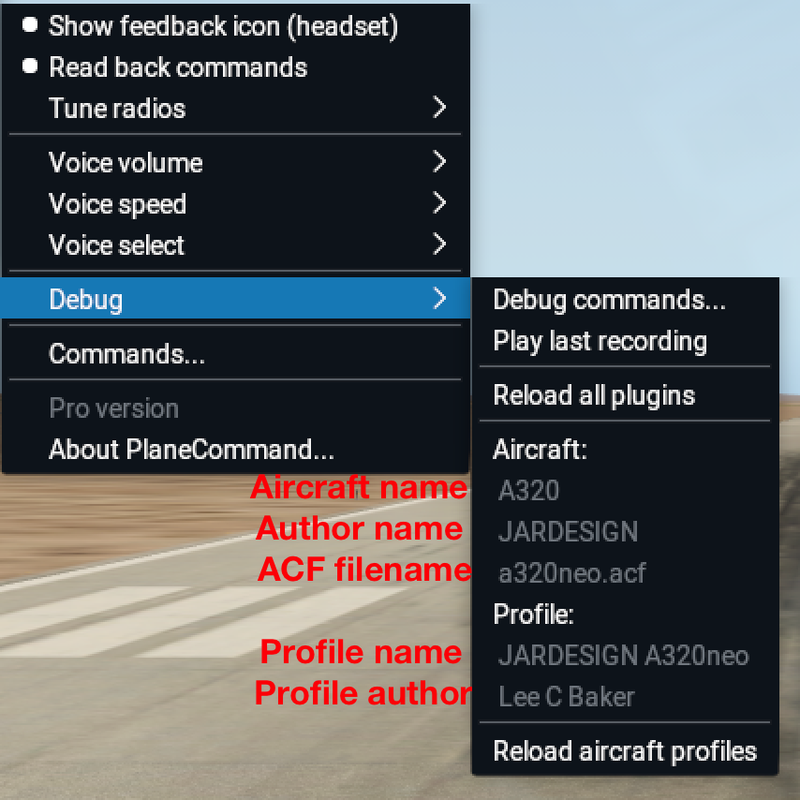 This is a good way to check that "name_filter" and "author_filter" are set correctly- load the aircraft and make sure your custom profile is being loaded at the same time. On-off systems of the aircraft are systems which can be thought of as being in an on or off state. They have a state (on or off) reflected in a dataref, a command to turn it off, and a command to turn it on. The status field is either a float or int dataref. When this is 0, the system is considered to be 'off'. When it's nonzero (even negative), the system is considered to be 'on'. The up and down commands are used to change the value, until the value dataref indicates the correct value. But wait, there's more! One additional complication: you may adjust this parameter by differently sized steps by providing more than one up and down, and specifying a step size. An example: we adjust speed with the 10-knot knob until we get close, then use the 1 knot knob (like a real person would do). The step size of each adjustment is indicated in PlaneCommand's internal units, which just happen to be knots. Finally, the 'value' and 'value_step' are a dataref and a scaling value used for measuring the parameter to be set. In 99% of cases, value_step should be 1.